Biosecurity is a set of measures designed to prevent the entry, establishment and spread of pests and diseases that could negatively impact the economy, the community or the environment. Biosecurity is a shared responsibility that requires collaboration between governments, industries, communities and producers. Everyone has a part to play. Good biosecurity supports the economies of the rural communities that rely on livestock production. In South Australia, Biosecurity SA, a division of Primary Industries and Regions SA, is responsible for making sure that the state has systems in place to monitor, detect, respond to and control pest and disease outbreaks, and food safety issues. These systems underpin South Australia’s status in export markets which in turn helps to protect our economy. But these systems work best with active participation from primary producers and their allied industries. Farm biosecurity is the management practices carried out on-farm to prevent the entry and spread of pests and diseases, and protect the livelihood of those who depend on reliable farm production. Having a strong and effective on-farm biosecurity system is essential for protecting your status as a premium livestock producer, and for maintaining and increasing access to both local and international markets. What is your role in farm biosecurity? Farm biosecurity is your responsibility, and that of every person working on or visiting your property. Remember, you have control over what happens on your property. Most disease problems can be avoided by using sensible biosecurity practices. The following recommendations will help you to reduce the risk of bringing a disease onto a property, and having it establish and spread to other livestock or properties. Check the Animal Health Declaration for relevant disease information before bringing livestock onto the property. Check the National Vendor Declaration. Source breeding stock from accredited producers. Don’t be afraid to ask questions about the livestock before purchase. Isolate and observe new arrivals for signs of illness. Monitor stock regularly and seek veterinary advice if you notice any unusual disease or illness. Keep accurate and accessible records on all stock movements (introductions and sales), treatments, purchased feed and any illness/deaths. Maintain stock-proof boundary fences and inspect them regularly. Don’t allow ruminants access to restricted animal material (RAM). Manage feral/pest animals and weeds. 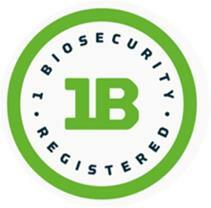 For additional information on farm biosecurity, tools and templates, please visit the Farm Biosecurity Website.